Don LaBonte, co-director of Convergence Academies—a three-year initiative through the Department of Education to test theories around connected learning to enhance curriculum—chats about the benefits of creative learning spaces. 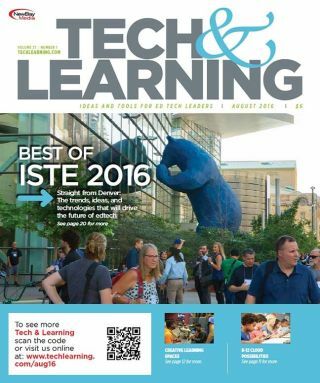 T&L offers this collection of ISTE highlights, including opinions and takeaways from our advisors, highlights from Kevin Hogan’s video interviews, and the winners of our “Best of ISTE” contest. One thing is clear: “sit and get” has got up and gone. Today’s PD has to prepare teachers for “a new way of teaching and learning. From various online options to teacher-leader models and more, districts are taking new methods and ideas on board. • T&L READER SURVEY DID YOU ATTEND ISTE THIS YEAR? • How Does Classroom Design Affect Student Engagement?